This and another similar photo came from Russia. It is probably from very early in February 1943, as many men appear to be in shock at what is happening. (Left, with peaked cap and monocle, facing right) is Generalleutnant Carl Rodenburg of the 76th Infantry Division; he was released from captivity on January 10, 1955. (Center left, with “crusher” hat, facing left) is Generalmajor Martin Lattmann of the 14th Panzer Division; he was released from captivity in 1948. (Center, in mountain cap) is Generalleutnant Werner Sanne of the 100th Jäger Division. 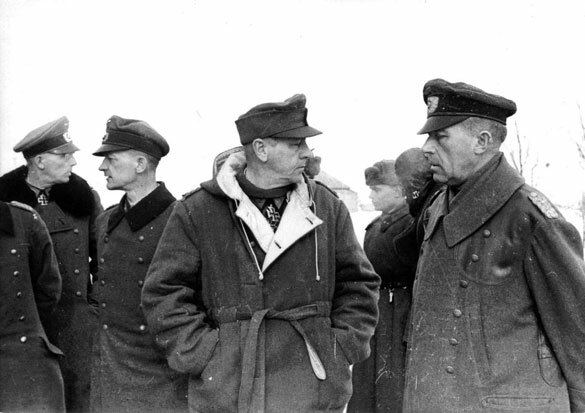 (Right, with crusher hat, facing left) is Generaloberst Karl Strecker of the XI Corps. Many German generals, captured at Stalingrad, later agreed to assist the Soviets by renouncing the National Socialist régime in Germany.